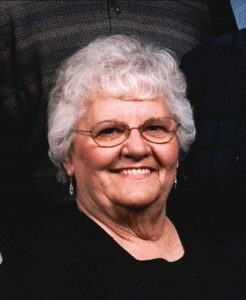 Sharon K. Hoeft, 75, of David City, died Monday, March 6 2017, at david place in David City. Funeral Service Thursday, March 9, 2017 10:30 A.M.
Sharon was born May 10, 1941, near Rising City to Orin and Marie(Kelly) Barlean. On April 5, 1942, she was baptized at the Methodist Church in Rising City. She attended area schools and graduated from David City High School in 1958. She was prom queen her senior year and was very active in band, pep club and Jobs Daughters. After high school she lived in Lincoln with her sister Carol and cousin Marilyn, working for Retail Credit until her marriage to Laverne Hoeft on February 9, 1963, at Immanuel Lutheran Church. She had been confirmed into the Lutheran faith on December 23, 1962. They lived and farmed south of Rising City and in 1968 moved north of Garrison. In 2008 they moved to David City. Laverne died in 2011. Sharon was very active in church and community. She taught Sunday School at Immanuel, was a 4-H Leader and member of Ladies Aid, holding all offices in these organizations "several times." She was also the President of the David City Alumni Association. Sharon had worked as church secretary at Immanuel, was secretary to Dr. Ralph Gregory, worked at the Banner Press and finally served as a dispatcher for the Butler County Sheriff from 1992-2014, a job she loved and cherished. In her "spare time", Sharon sold Avon for over 30 years. She was involved with Project Linus(making quilts for the hospital), card club, the David City Red Hats, Immanuel Lutheran Church and the Ladies Aid. She loved going out to eat with friends and each of her grandchildren has a quilt Grandma made especially for them. Sharon is survived by daughters; Beth(Brian) Zeilinger of Rising city, Dawn Hoeft of Columbus, son Scott(Sandy) Hoeft of David City, 8 grandchildren; Tanner, Austin and Kalan Zeilinger, Megan, Broderick, Morgan, Lauren and Madison Hoeft. Also surviving is her mother, Ruby Barlean of David City, sisters Carol(Bill) Lawler of Houston and Connie(Larry) Coffey of Phoenix, sister-in-law Lois Gregory of Lincoln and numerous nieces, nephews, cousins and friends. She was preceded in death by her parents Orin and Marie(Kelly) Barlean, husband Laverne, mother and father-in-law Henry and Hilda Hoeft and brothers-in-law Dennis Hoeft, Ralph Gregory and Jon Rose.